It’s hard, trying to wean yourself off an addiction to theatre. You make decisions about what to see, or more accurately what not to see, and then have to stick by them. But then the damn plays get West End transfers and so the resolve has to be reinstated and redoubled, the increasing glowing recommendations from friends ignored. 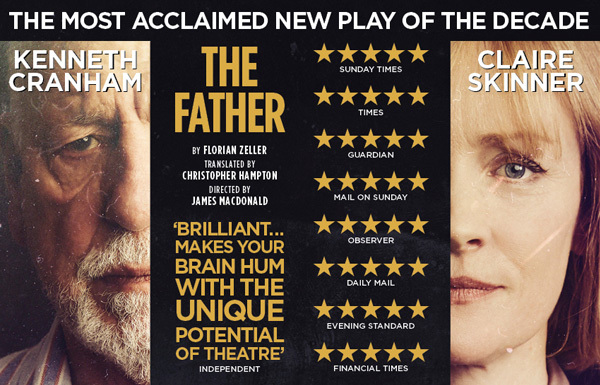 So it will come as no surprise that in the case of Florian Zeller’s The Father, first seen in London at the Tricycle and then moved to the Wyndham’s, I cracked. I should state that my primary reasons for not going were not about the quality of this Theatre Royal Bath production, but rather that I’d been warned it would make me cry a lot and I don’t much like being distraught in theatres (or cinemas for that matter, I had to wait for Amour to come out on DVD before daring to watch it and rightly so). And as a portrayal of, or a theatrical assumption of, the experience of a dementia-riddled mind, it is certainly most affecting. I have to say though that James MacDonald’s production didn’t make me cry (that much, until the very end that is…), its hard edges and cool demeanour eschew any sense of mawkishness or emotional manipulation but for me, they also gave a crucial feel of real detachment. Kenneth Cranham’s Andre is the man who is becoming increasingly confused, unsure of the veracity of anything he sees, or that his daughter Anne tells him, or that his carers might or might not be stealing from him. Miriam Buether’s set plays into this, changing almost imperceptibly with every scene change, each scene playing out first like a memory but then warping into something more absurd, throwing question after question into the void, testing our notions of time and space and keeping things most unnerving. Cranham is excellent, Claire Skinner’s Anne is also superb, but until those final few crushing moments, it was surprisingly hard to really connect with the world of the play.